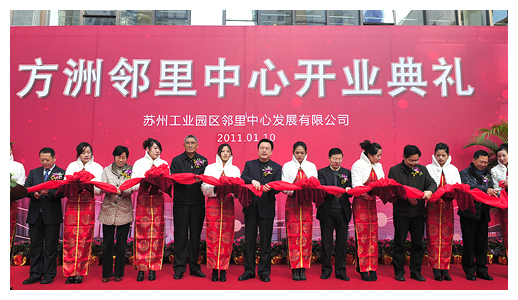 Fangzhou Neighborhood Center, the 8th project launched by SIP Neighborhood Center Development in SIP, opened for business on January 10. Covering a total floor area of 28,900 square meters, the facilities have several functions of dining and wining, recreation and entertainment, and training. Located at the crossing of Fangzhou Road and Jinliang Street, with 186 underground parking spaces, the new shopping center has 12 regular functions and cooperates with familiar chain stores. In addition, it also introduces over 80 new brands including Mannings the personal care store and Jourdeness, an international beauty shop, which greatly optimize the business structure and improve the consumption services in Hudong area. The highlight of the project is the fact that it has the first self-run fresh food supermarket. The manager promised safe, reliable, and affordable groceries by getting products directly from vegetable bases and manufacturers. Price control is the priority of its daily management and, in this sense, the Center also plays an active role in stabilizing vegetable prices in the area. Apart from community work office and one-stop service hall, the Center also houses a neighborhood activity space of 700 square meters and a community reading room by cooperating with Suzhou Dushu Lake library, putting on shelf more than one thousand books and hundreds of newspapers and magazines. As one of the successful projects launched on the basis of the successful public service administration (PSA) in Singapore, SIP's Neighborhood Center has grown steadily in the past 13 years. Since the opening of Xincheng Building, the first project, on May 30, 1998, there are at present eight centers with a total investment of over 600 million yuan and construction area of 157,100 square meters, which makes it a leading community business brand in the country.